Part of our metal collection, our Lamina Foil cups are a staple in many different types of establishments. They can be used in a variety of different ways, especially for baking personal treats, displaying small candies, or sending confectioneries home with customers. Many different establishments including cafeterias, bakeries, cupcake shops, candy shops, and food trucks are using our Lamina Foil cups to display their treats. Each cup is made from aluminum foil, so these cups are not only disposable, but they are also recyclable and versatile. Thus, they are very convenient to have as a staple on any table. You can use our Lamina Foil cups to not only showcase, but also bake, your delicious treats. We make these cups to be gorgeous so they bring chicness to any venue, including weddings, banquets, and dinner parties. Everyone will love your cute baking cups, especially if they have a colorful design. Our Lamina Foil cups come in many different shapes and sizes, so you will surely find the perfect pan for any culinary creation. Whether you are looking for a cup to serve cupcakes or breads in, Restaurantware has the answer in our Lamina Foil collection. Chefs around the world use these Lamina Foil cups for baking and serving many different treats and culinary creations. People love that they can stay within themes while using our Lamina Foil cups, which you can’t do with many other tableware pieces. We have specific designs and special shapes to adhere to many different party themes, such as Valentine’s Day, retro, animal, and luxury. Each cups also comes with a durable lid, so if you’re sending treats home with your guests, then there is no need to worry about safe transportation. We offer many different designs and colors, so you can pick out the best one for you. Since our Lamina Foil cups are made from aluminum foil, they are easy to recycle. This beats many other disposables that take up unnecessary space in landfills for years. These cups are easy on the environment because once they are recycled, they are melted down and used for other metal products. Recycled metal reduces pollution and energy use because it lessens the need for us to create brand new metal. Thus, this also eliminates the need for more unrenewable resources. Reusing materials helps us build a more sustainable lifestyle, which will lead a better path for future generations. The restaurant industry has power in creating a better world because we can work together to reduce waste and use recyclable materials. These cups are also very resilient in the kitchen because they are aluminum foil. These cups can be used in ovens or freezers, dpending on your needs. 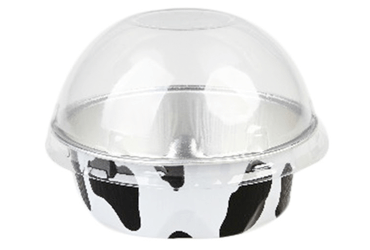 Our Lamina Foil baking cups can withstand up to 500 degrees Fahrenheit as well as freezing temperatures. Thus, there are endless possibilities for using these cups in your kitchen. They are mainly used to bake little treats, like cupcakes, muffins, mini-cakes, mini-pies, souffles, breads, and many more. 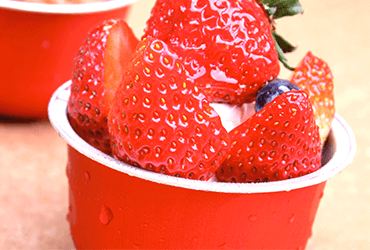 However, you can also serve ice cream, frozen yogurt, and other cold treats in these cups. Our Lamini Foil collection is a great addition to any dessert, appetizer, or candy table. Your customers will love eating out of these chic cups, and you will love the easy cleanup. 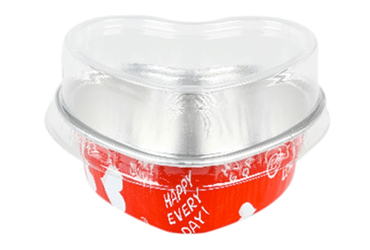 These Lamina Foil baking cups may be small, but they will have a long-lasting impact in your establishment. Whether you run a popular catering business, serve thousands in a stadium, feed families in a boom restaurant, or bake cute cakes on the weekends, these baking cups can help in a variety of ways. With the strength and class of these cups, it’s hard to believe they are disposable, let alone recyclable. Our Lamina Foil cups redefine the culinary world with their versatility and modern design. We have a broad range of Lamina Foil cups for you to choose from. We have colors including gold, black, red, silver, and coffee. Additionally, we also have unique designs like hearts and cow lines. Each bring character to any table. Our Lamina Foil cups also come in different shapes, such as round, loaf, heart, and square. Thus, depending on the creation you’re planning on presenting, you can find the perfect cup to impress your customers. The unique designs and shapes also add a personal and creative touch to your dishes. The opportunities are endless when using our Lamina Foil baking cups. Our Lamina Foil cups are perfect for a variety of venues, indoors and out. Whether you are planning a wedding, banquet, or show, these cups will surely impress everyone. Not only do our aluminum foil disposable cups handle foods of different temperature, but they are also very stylish. These will surely catch the attention of all of your customers. Everyone will talk about your cute baking cups, but even more so about the delicious treats you serve in them. At Restaurantware, we strive to bring you the most fashionable and eco-friendly tableware available and our Lamina Foil cups have a great balance of both standards. Each is uniquely designed to impress customers with their durability and style. Your customers can easily enjoy your delicious creations from these cups without cutting, ripping, or tearing them. These cups are made of premium aluminum, so they are very strong and also recyclable. These cups are a modern addition to every restaurant because they also redefine baking, serving, and storing culinary creations. We offer the most fashionable and green tableware available, so you can supply your business without worrying about the environment. We also try to provide premium tableware at an affordable price, so your budget can be happy too. We know you’re constantly looking for the hottest trends, and our Lamina Foil cups are topping lists. So, don’t hesitate -- browse our different colors, styles, and sizes of disposable baking cups today!